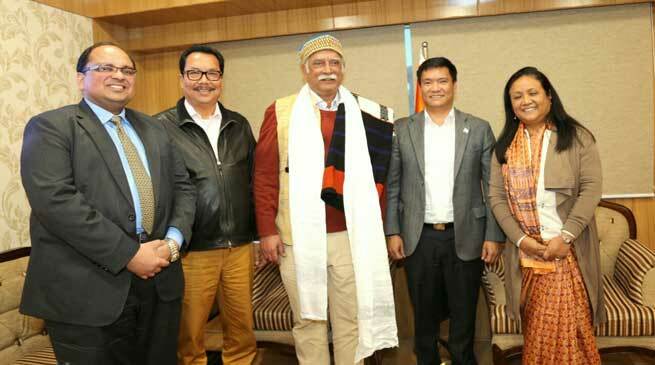 Union Minister for Civil Aviation Ashok Gajapathi Raju today said that the Central Government is committed to gift Arunachal Pradesh with a full-fledged airport and is positively looking forward to it. Interacting with officials of the state Civil Aviation officers in presence of Chief Minister Pema Khandu, Deputy Chief Minister Chowna Mein, Chief Secretary Shakuntala D Gamlin and Principal Secretary Satya Gopal here this afternoon, Raju informed that a central team has recently surveyed both the sites at Karsingsa and Hollongi proposed for an airport and his ministry is waiting for the report. He said the detailed report and its submissions would be then forwarded to the state government for a final call and expressed optimism that works on the airport would begin soon. “This is a beautiful state and I am so happy to be here. And I also want to be of assistance in any way possible for its development,” he said on a lighter note. Going through a power-point presentation made by the department seeking operationalisation of civil terminus in the upcoming airports in the state, Raju assured that he would have a meeting with concerned agencies like DGCA and resolve all pending issues. Meanwhile, he asked the state Civil Aviation department to find out concrete ways and means to do away with issues that are proving hurdles in implementation of the proposals. He assured full support and cooperation from the Ministry in strengthening air connectivity in the state. The State Government has been requesting the Centre to allow use of civilian terminus in the various ALGs coming up in the state for ATRs, which are under the control of the Indian Air Force. The State Government, which is planning to run commercial ATR flights, for about three months on experiment basis to start with, also requested the Minister to give one time relaxation on some stringent rules. Raju, while saying that safety and security angles cannot be compromised, assured that the Ministry can consider some other rules concerning with administration, etc. He also suggested the state government to look out for possibilities in bringing in cargo flights as the state has immense potential in horticulture crops, floriculture and medicinal plants. Earlier, in a one-to-ne interaction with the Chief Minister, Raju, who will attend the Digi-Dhan Abhiyan programme tomorrow here, wanted to know the impact of demonetization in the state. The Chief Minister informed that as the state has a population of about 14 lakhs only, the initiative to curb black money by the Prime Minister was widely accepted by the people. Former Planning Secretary of the state Ankur Garg, who is now Private Secretary to the Union Minister, is accompanying Raju.